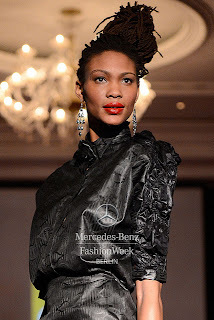 Fashion world latest Fashion: AFRICA fashion day BERLIN Mercedes Benz fashion show. AFRICA fashion day BERLIN Mercedes Benz fashion show. Recognizing the popularity of Africa fashion in the US, Great Britain and Africa, the Africa Fashion Day is set to raise its profile in Europe and worldwide. On schedule are successful international designers such as Romero Bryan, Nomi by Naomi and Adama Paris who will present at the runway show "Urban Fashion Night". The event will take place at 7:00 pm at the prestigious Hotel Adlon Kempinski and is part of the Berlin Fashion week (January 15-20, 2013). Labels: AFRICA fashion day BERLIN Mercedes Benz fashion show.